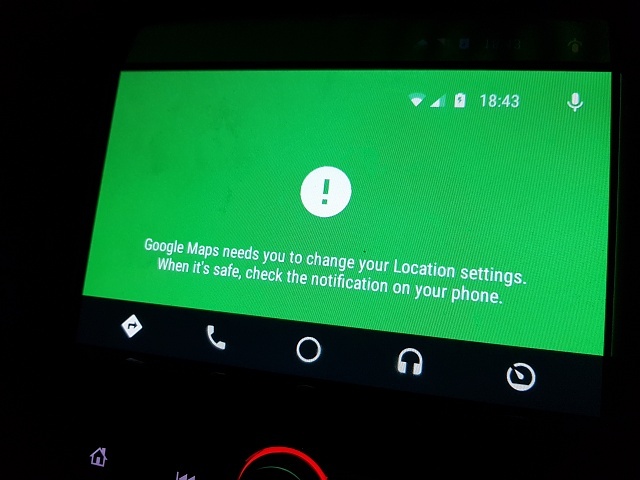 When trying to use the maps the full message is shown on a green screen "Google maps needs to change your location settings. When it's safe, check the notification on your phone"
The phone doesn't do anything when you click this notification. The message only comes up when the S9 locks. All location settings are enabled and I have reinstall android auto and cleared data also from Google maps as well. This message just stays on the screen and you can't go back out of it. All worked perfectly before updating to Android Pie. This means android auto is unusable at the minute. make sure this is turned on. I've got exactly the same problem. Any idea yet? What a brick i now have after update . Bluetooth now locks up phone when connected to audio device. DO NOT DISTURB now has no setting to allow text and calls only. Volume button no icon to alter other volumes system or media. And this is just on the first day what else will i find. It effects both Google Maps and Waze. With Waze you don't get the ugly green screen error, instead your location just stops updating. I believe that it is related to the "lock screen" time out. As soon as the lock screen happens you get the error. I don't get how they can't test something like this. Seems it's basically unusable until a software update comes out. Have you enabled all necessary permissions for the android auto app on your phone? i use Android Auto every day and it works for me without issue. I would suggest clearing the app cache and uninstalling it. then download and reinstall it. I've got exactly the same issue on my Discover pro since the pie update on my S9. Already saw a topic on the Samsung community also. The issue is solved for me. I've activated Always On Display, after i found out that the connection was working when the phone was unlocked, and the gps signal was lost at the moment the screen turned black. I also checked my energy save settings and disabled the option that the Always On Display can be turned off. Perhaps this can work for you as well! See my general reply for my solution!